Viking Sisters is rated 3.8 out of 5 by 23. Rated 5 out of 5 by Momma_Llama from Sisters are as good as Brothers! 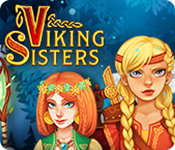 If you like the Viking Brothers games, you'll enjoy the Viking Sisters game. Just as good and fun with a slightly different story line. Well worth playing. Rated 5 out of 5 by karenmusik from First the dishes, then we save the world Loving this game. Sisters must battle an evil sorceress to save their village. They don't see themselves as heroes, but set out to get the job done and persevere until they succeed. (The everyday life of most moms.) It's the female version of Viking Brothers and it has most of the elements that I love plus a few new ones thrown in. Yes, the graphics are a bit off and washing the dishes first was silly, but after that the game has a lot going for it. Love the different portals, since you really have to stay focused. There's 3 levels of play and some interesting strategies to figure out, so plenty of replay opportunities abound. I get that this isn't for everyone, but I'm super happy with it. Rated 5 out of 5 by difficult1 from Viking Sisters are killing it. I, like another reviewer, nearly spat out my breaky when I saw the first level starts with a dirty dishes clean up (!) I was going to give it 2 levels, and if similar, was just going to dismiss it. Thank Goodness after that it was girl power all the way! Similar to Viking Brothers, the game is a great TM game for those of us desperate for them. The graphics are bright and the story line is interesting enough. On Hard, many levels need to be replayed once you know what you need, and I love that aspect. A very worthy change from the boys. Thank you and more TM games, please! Rated 5 out of 5 by jakleen24 from I am SO HAPPY!! I am thrilled Viking Sisters is available for us. I am not a Hidden Object lover, although I realize I'm in the minority, but Strategy and Time Management -- I love 'em! I recently moved to Windows 10, and lost several of the TM games that I love. This game is no disappointment at all. I play for fun, and enjoy trying to play the scene a little faster 'next time.' Technical stuff -- I'm no help there, but sheer enjoyment of this type of game .. I'm in heaven! Thanks for remembering those of us who love TM and Strategy games! Rated 5 out of 5 by JeansLady1 from It's the girl's turn to entertain us This is a wonderful TM game. I've played a few of the Viking Brothers games, so I really perked up when I saw this game. I played three levels and purchased it. It's fun and the graphics are terrific - very colorful. I like having the puzzle pieces to find. Thank goodness they are easier to find than the ones in the Alicia Quatermain games - although I love those games, too. I always look for TM games with an untimed/easy mode, so that's another plus on this one for me. This is a really delightful, fun game all the way around. I hope we see the sisters in another game sometime. Rated 5 out of 5 by Monkeygus from Sistas Be Doing It, Doing It! If you love The Viking Brothers games, you'll love this one! Basically the same game with female heroes, this one focuses on an evil Sorceress who steals the men folk from the village (the Viking Brothers make an appearance) because she thinks they will look good as statues in her garden. The Viking Sisters aren't going to stand for that, so off they go, with the help of the Goddesses to stop this foolishness. The game comes in three modes (I'm a fan of the casual mode). 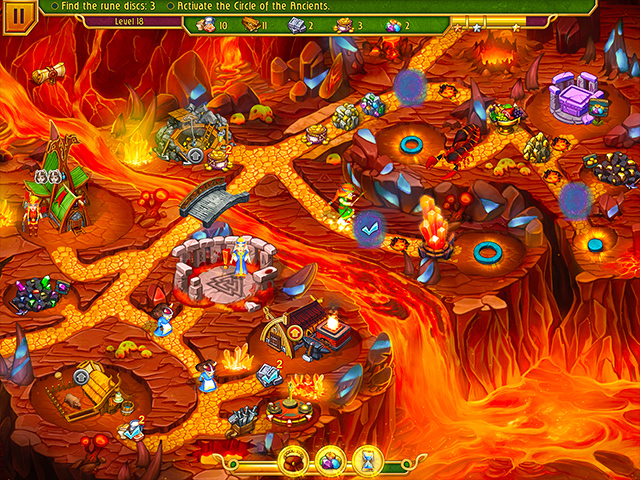 The pace is fun and the graphics are colorful and well drawn. My only complaint are the puzzle pieces. I haven't quite figured out whether they are in every level (like most time management games) or if I just haven't noticed them in some of the levels. Doesn't really matter to me since I'll be playing this more than once. 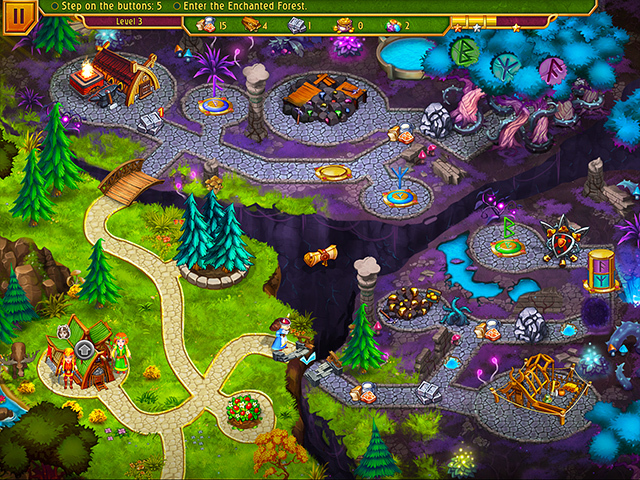 This one is fun with some challenging levels that make you use strategy to get around. Like I said, if you are a fan of The Viking Brothers series, you'll like this one too. Try the demo for yourself. Rated 5 out of 5 by dgriffith from First we had the Brothers, now it's the Sisters turn! This was a fun surprise to see this morning! I love the Viking Brothers games and have all of them, now though, it's the sisters turn to go up against the evil sorceress. The graphics are bright and colorful and the sisters are cute. If you have played any of the Viking Brothers games, you'll recognize the farm, the sawmill and the berry bushes as they are the same. However there some new buildings which is refreshing to see! The game does have 3 different modes to play so that is nice as it makes it possible for all players who enjoy this type of game to play it! I downloaded the demo and played the first 4 levels and then I quickly purchased it with a PCC that I had to use before it expired. However, if I didn't have a PCC to use, I would still have quickly purchased it! Give the game a try and I hope you enjoy it as much as I am! Rated 5 out of 5 by joybelle_1 from Just as much fun as their Brothers! Whilst I was a bit concerned on level one where the sisters first task was to wash the dishes, it soon became and adventure and the sisters were off on similar adventures to their brothers. In fact it could be seen as the same game with a few differerent features to Viking Bros. What's different? 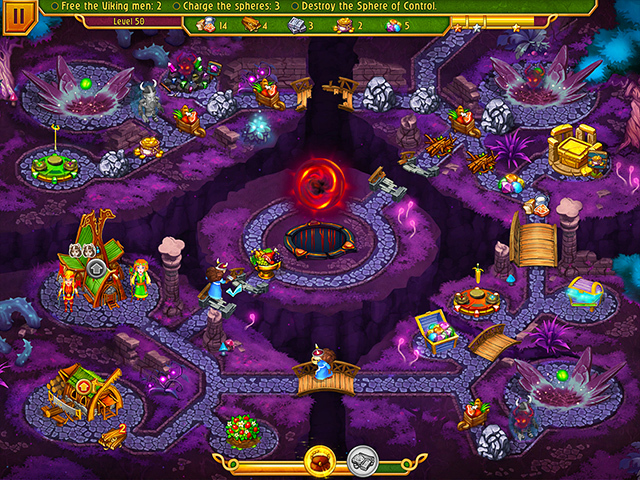 Whilst still a standard 'gather resources' TM, with the build and upgrade, clear the paths, complete the quests and use your bonuses wisely, In this game chests containing resources must be first opened with a key, and food and trees must be re-grown with a quantity of gems once they are expired. Meaning there are more places and buildings to visit. There is also an alter that changes food to gold. The action is fast and smooth, the graphics are top quality, and every few levels there is a mini-game mahjong style to play. There are also puzzle pieces to find (but they are huge lol) and hovering your mouse over the level tells you if there is one. All in all, a real winner and lot of fun. Enjoy TM fans!